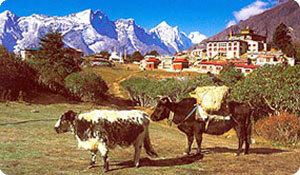 Everst view trekking is known as Everest panorma trekking to explore the Everest base camp trekking trails. Everest view trekking is famous trekking route in Everest region. Everest view trekking is suitable for those people who has limit or short holiday duration for Nepal Himalaya trekking.Everest panorama trekking is not only for its proximity to the world's highest mountain 8,848m but also for its friendly Sherpa people, picturesque villages, great variety of cultures and traditions, colorful festivals and monasteries. Everest panorama trekking provides a good insight into Sherpa culture without the struggle of high altitude trekking The story of the yeti is still a mystery in the world from the Khumbu region. Beautiful, multi-hued prayer flags prayer wheels and intricately carved Mani stones line every hilltop, rock wall and trailside singing prayers to the gods with every breeze and every passing traveler. Everest view trekking is ideal for those with less time who nevertheless want a view of Everest including other famous mountain in Khumbu Himalaya range. Our destination is the village of Tyangboche with its famous monastery where you have time to soak up the atmosphere along with some tremendous views of the very beautiful mountain Ama Dablam. For Everest panorama trekking, you are able to arrange trip whether by bus from Jiri or by fly Kathmandu to Lukla and Himalaya journey professonal will generate Everest panorama trekking itinerary according to cleints holiday schedule. Highest access of the trek: Tyanboche 3990 Meters. Day 01: Arrival in Kathmandu (1334m), transfer Hotel,Everest view trekking briefing with officially arrangments. overnight at kathmandu. Day 16: After breakfast, our tour guide will take to for historical monuments sightseeing in kathmandu valley such as Boudhhanath : visit Bodhnath Stupa, one of the biggest Buddhist shrines in the world, where we observe Buddhist monks in prayer in the monasteries surrounding the stupa than visit Pashupatinath: the most famous Hindu temple in the country, located on the banks of the holy Bagmati River. Here you see Hindu holy men (sadhus) meditating, pilgrims bathing and occasionally funeral pyres burning on the ghats. Bhaktapur: you will enjoy with different spectacular Himalayan scenery , old architecture, 55 windows, Pottry farm, king curd and old style primitive houses. Kathmandu durbar square: you will enjoy with different Hindus Temple, Goddes Kumari, legend of kathmadu valley.Monkey temple(swyambhunath): you will enjoy with Budhhist stupa from where you will see whole kathmandu valley view including the Himalayan views ,Patan Dubare square: Patan city is the temple city of Nepal where you will see the many temple,Mahabudhha , Golden temple etc and in the evening farewell dinner in Nepalese Restaurant, overnight at kathmandu in Hotel.